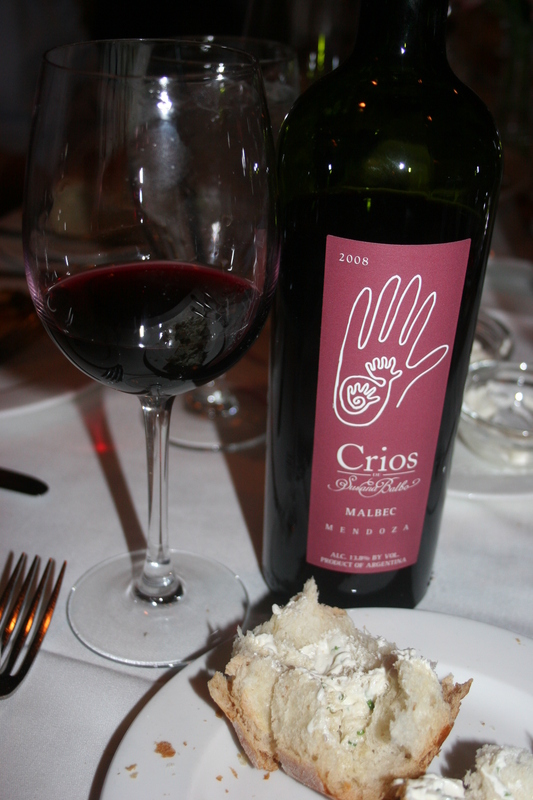 The 2008 Susana Balbo “Crios” Malbec appeared to be a safe choice and something that might go well with a steak. The wine has a full bouquet of cherries and spices and a lush mouthfeel that I could tell would go well with a nice filet. On this particular evening you could be factually correct in calling it a $15.00 wine that drinks like a $50.00 wine because that’s how much it was on the wine list (can you sense I am missing my BYOB’s?). There were a few different appetizers brought to the table, some nice shrimp cocktail, fried calamari and some tuna. 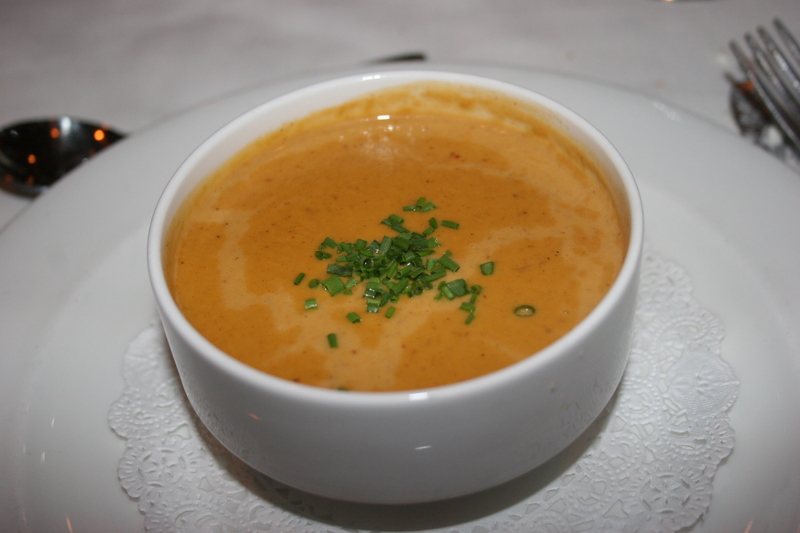 I decided to try the lobster bisque. It came nice and hot to the table, had good color and pleasant taste. It was not one of those bisque that featured large pieces of lobster. There were a few, but it lived up to its bisque name. Most of the others at the table thought it was fine. I also had the Creed’s Classic Wedge Salad, applewood smoked bacon, fresh roma tomatoes, hard-boiled egg and blue cheese dressing. In my opinion, there are few salads better than the wedge of iceburg lettuce with tangy blue cheese dressing. This one was no exception; fresh and delicious. Most of the group chose steak as their entree . 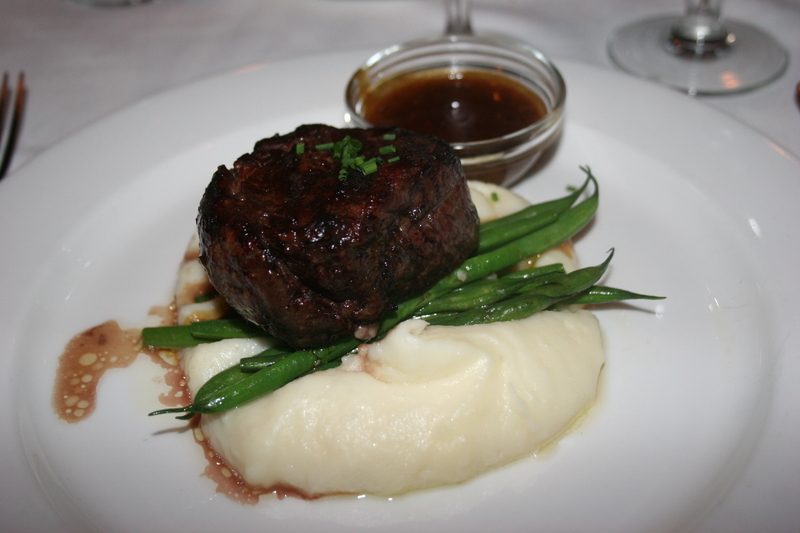 I selected the Center Cut Filet Mignon with Brandy Peppercorn Sauce ($38). It came with green beans and the meat nestled nicely on a bed of potatoes. The steak was ok, nothing special and I’d rate the entire entree a C. I’m not sure what I was expecting at Creed’s but whatever my expectations were, they were not exceeded. It’s hard to explain, they seem to do all the right things, refilling your water glass, replacing silverware, scooping up crumbs. Maybe it was the fact that we had nine people and it just seemed to have “wedding meal” feel to the entire evening. One of the group ventured from the carnivore trail and ordered one of the evening “specials”, the Tile Fish, a firm, mild flavored white fish. The dish looked inviting and he was pleased with his choice. The others all seemed to choose the other “special” of the evening., “Surf and Turf”, a decent size helping of filet accompanied by a crab cake. 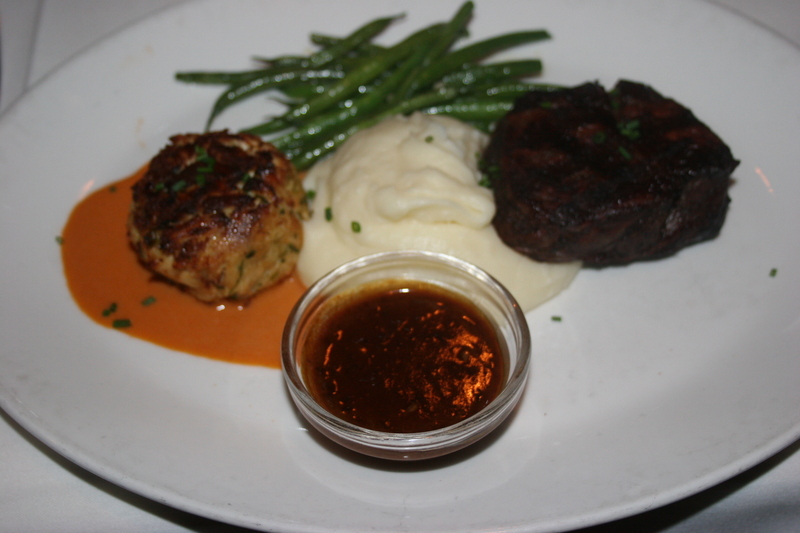 Again, most of our party thought the steak was average at best although some found the crab cake very good. 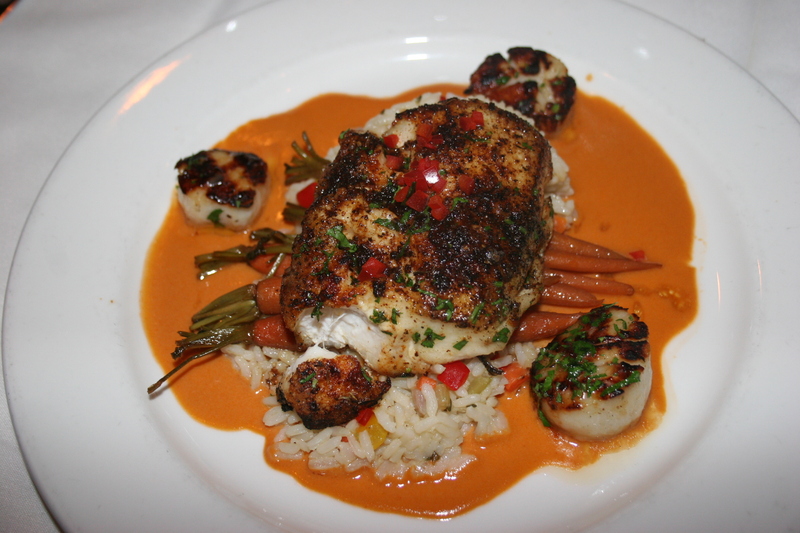 Overall, it was an enjoyable evening and I can’t say it was a bad meal, it just wasn’t anything memorable. If you go to Creed’s, visit their website prior to going and print out the online coupon offering $15.00 OFF the purchase of two entrees prior to 6:00 P.M.